About a month ago I had follow up appointments and scans at Dana-Farber. It was totally uneventful (we like that) but I had an exchange with my oncologist that stuck with me, and since it’s International Women’s Day, I thought I’d write about it. Last year, toward the end of my treatment for stage III breast cancer, I learned my oncologist Dr. Y was moving to Seattle to be closer to family. I was devastated, at this point we had built a rapport and considered her my rock during treatment. I congratulated her of course, and asked her how many of her patients does she need to tell; she said 900 (!!!) but not to worry, because my new oncologist Dr. P is wonderful and I will be in excellent hands. During the week of the 2016 election I had my first appointment with Dr. P. It was hard to avoid any commentary of political news, she and I were both in shock and exhausted by the lack of sleep with concern over the election outcome. But I left there feeling good, she was my people. Dr. P and I were catching up and I mentioned that I recently sent a card to Dr. Y. 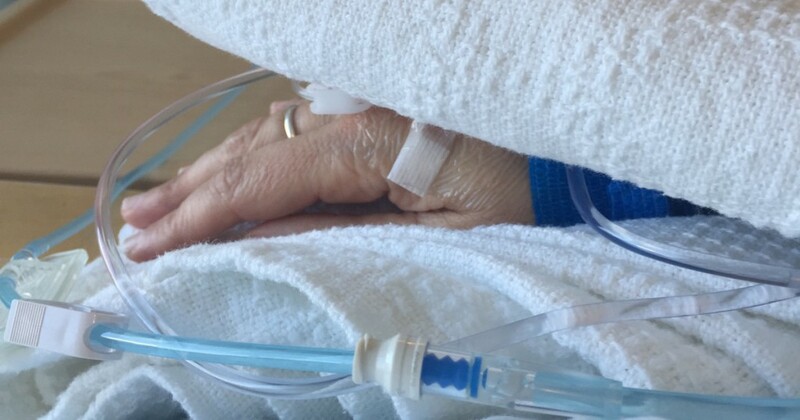 It had been two years since my diagnosis, and I wanted to thank her. Dr. P smiled and said that’s wonderful, that she and Dr. Y still talk and see each other regularly at conferences. They always share a hotel room. 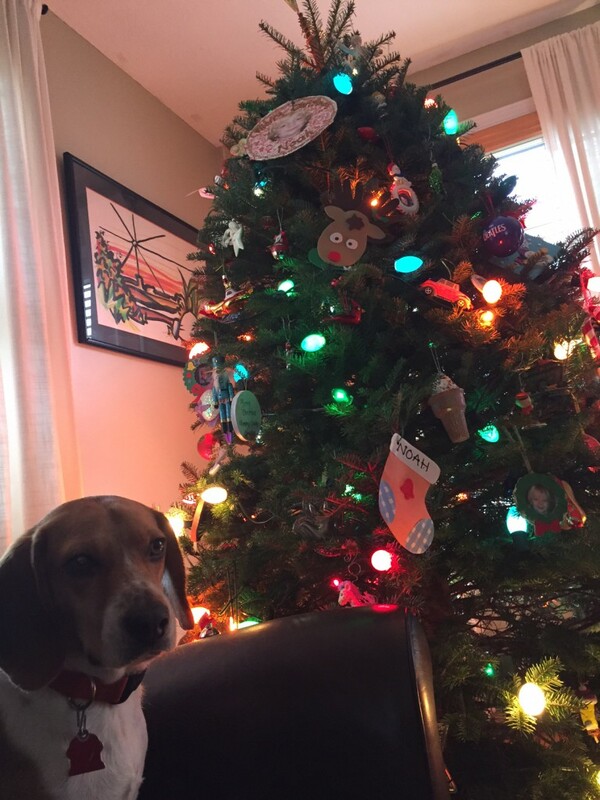 I looked up at her. Women who work and travel together have a close trusting relationship, personally and professionally. I consider the women I travel with as family away from home, the friendly faces that offer to get coffee, share Band-Aids for blisters and walk each other back safely to hotel rooms. It’s a sisterhood. Dr. Y didn’t have to refer one of her 900 patients to her friend and colleague, but she did. I realized in that one moment, I have two oncologists, not one. So here’s to the tribes of women who have worked, traveled, lived, laughed, cried and taken care of each other. 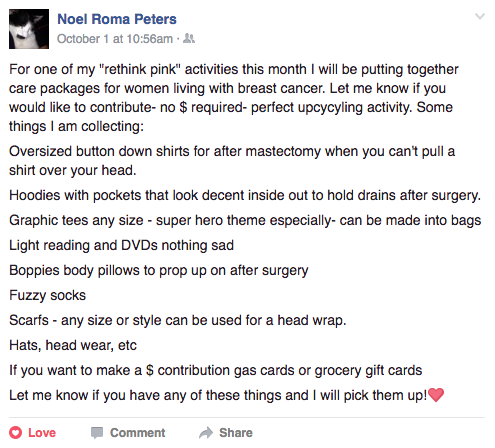 As a breast cancer patient (I’ll always be one) this is my first Pinktober. I’m two weeks in, and here’s the thing… wearing pink “for awareness”, without taking any other action, is NOT the same as fighting breast cancer. I love football. Yet when I see the NFL’s carefully crafted marketing and spending on pink merchandise that could go toward finding a cure rather than “create awareness” of a disease that pretty much everyone already knows about drives me just as crazy as this election cycle. It’s not just the NFL, smaller businesses are blinded by the NFL’s success and capitalizing on all things pink. 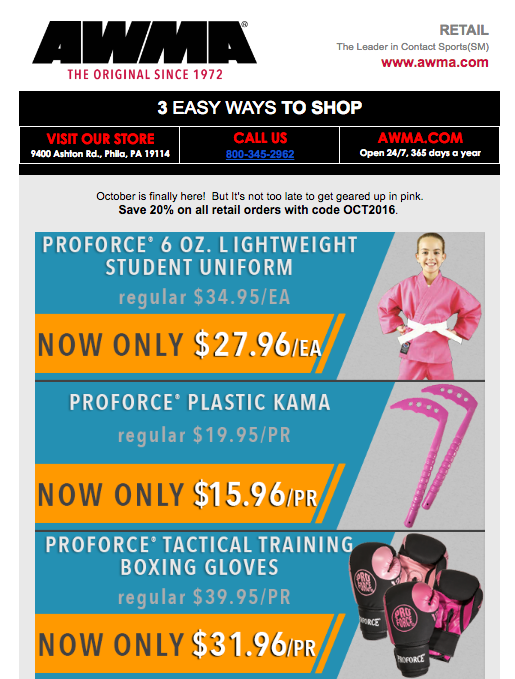 Here’s an email I received from AWMA, a martial arts gear supplier. The irony here is that the sport helped get through some of my darkest days going through breast cancer treatment. Obviously they aren’t the only ones. Now, to be very clear, I have no trouble when using pink as demonstrating support. Our local youth football league sold pink shirts to parents of players. My kids see this, and they know that their teams have their backs. They also take action beyond “awareness.” And for the six or so years we’ve been part of youth and high school football, I know of five mothers diagnosed with breast cancer whose kids play. One passed away last year from Stage IV – she was an oncology nurse, helping others with breast cancer. My dojo family demonstrates support the same way. They take action, and go beyond Pinktober – the DFMA tournament is held in June. What I have a problem with are the businesses that sell the pink shirts and the pink belts knowing that they are for Pinktober. Why not donate some of the proceeds? Another idea is to increase prices, even by a dollar with the commitment to finding a cure. Because here’s the reality – I’m not considered cured until I die of something else. And I’m not the only one. This summer I went through this phase of researching long-term disability insurance options, rewriting our wills and reviewing life insurance policies. We also got a new dog, not only because we missed our old dog, but because I didn’t want to regret getting another dog for the kids in case something happened to me. I also started studying constellations – my youngest son had “studying stars” as part of a summer project, and I just kept going. So each night while walking Joe I’d look up, see how many more constellations I could identify, and try to think beyond my small little world. You see where I am going with this. When I was first diagnosed with breast cancer in November 2015, I was indeed upset, but I wasn’t concerned with the prognosis. It was when I was restaged after surgery that I went downhill. In light of all of these preparations I took on this summer, I was absolutely convinced I was dying. Intellectually, of course, I knew this was not true; I still have so much treatment ahead of me, one drug that is new, the other changing the HER2+ diagnosis from one that was extremely poor before 1998 to one that is very treatable. But every day in the pit of my stomach, I thought it had to be more than just a coincidence that I would start prepping in the case of my death and wondering more about the notion of heaven only a few months prior to my diagnosis. I was convinced my actions were signs of things to come, and I became more frustrated than ever that I logically could not get passed it. This despair and obsession lasted for weeks. Then, this week a social worker called from Dana-Farber. I told her this story. “That’s called intuition,” she said. “I hear stories like that all the time.” No kidding. And then I remembered the last time I took a Myers-Briggs test, I came up as INFJ. Of course I was freaking out. But it was completely normal. There was comfort in that, and in the past few days, I haven’t really thought about it. I decided the first week of January to be treated in Boston at the Dana-Farber Cancer Institute. It’s a bit far from where we live, but nothing unmanageable. And Boston is my hometown. It would be a disservice to me and my family if I didn’t go to one of the best cancer clinics and research facilities in the world that happens to be two hours away. So as of 1/7/16, I have been (and will be) in Boston every week for twelve Taxol infusions, receiving Herceptin and Perjeta every third week. Once that’s completed, I’ll receive four rounds of the Adriamycin / Cytoxan cocktail (also affectionately known as “the red devil“) over another twelve weeks. Then I’ll receive more surgery, then radiation, and more Herceptin every three weeks. 2016 will certainly be a long year, but we’ll definitely make the most of it. The crazy part, so far, I feel fine. I get tired a few days after treatment days, but nothing absolutely unusual, and I love going to Dana-Farber. Tomorrow is my fourth round of Taxol, and just yesterday my hair started to fall out – not in big chunks, but lots of noticeable strands everywhere. Just as well, really, it was going to happen eventually. I’ve thought pretty hard about sharing ongoing details. Things on the internet live forever. And of course I realize what will come up in search results under my name (beyond the other Monica Wright, of course.) It’s hard to be public about something so personally frightening, while maintaining strength and composure. 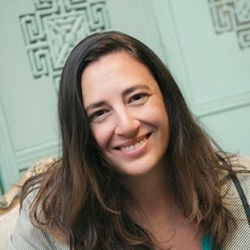 But last week while looking at the Dana-Farber site I came across Tara Shuman’s blog, she articulated so many things I was feeling, there were too many similarities to our stories. I asked her about her book and read the entire thing in one day. I wasn’t alone. I realized that there are thousands of us at any given time, and when I can give back (not IF, but WHEN), I hope somehow I’ll be able to guide others through this journey, too. I am Catholic, but that doesn’t matter. My friends of all faiths have been praying, lighting candles, putting my name on temple rolls, sending reassuring words of encouragement for weeks. After my surgery on Dec. 11, I learned that the cancer was indeed in the lymph nodes – in fact in all four of the lymph nodes biopsied. Despite two mammograms, three ultrasounds and an MRI, the tumor was three times larger than projected. The pre-cancerous area was twice as large as projected. When I was first diagnosed I was afraid of pain, treatments and the long road to recovery. Then in an instant I became afraid for my life. It’s now Stage III, not Stage I. It’s now Grade 3, not Grade 2. I have some very naughty cells trying to take over. So naughty that the surgeon couldn’t get clean margins after surgery. What if it has spread to the rest of my body? And what if they come back, two, five, ten years from now? The risk has felt very real – a wonderful woman whose son plays in the same football league as my son just passed away this fall after a recurrence. I was in despair. My family and friends knew this, and the good vibes continued to come. The calls, the stories about long lives, the food, the surprise gifts, and the jokes all still came. 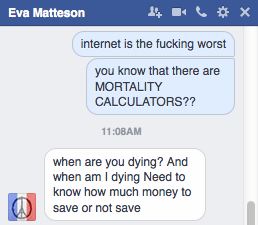 My aunt and one of my oldest friends both joined Facebook – after years and years of protest – only to check in on me. I had friends ready to hop on planes. 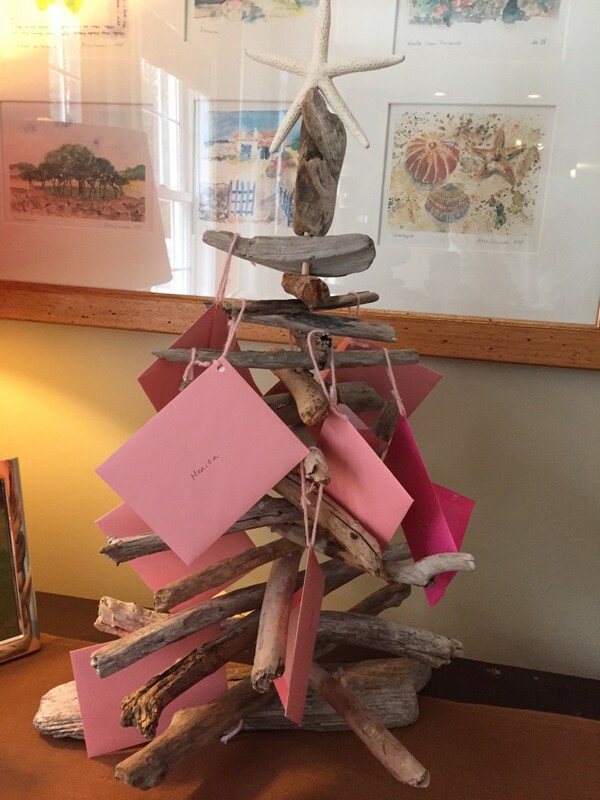 I even received cards and letters from friends of friends – people I have never even met – offering words of hope, to remind me to fight, that the not knowing is the darkest place. And what also came were the flood of prayers. Now I have many friends who are atheists who I know will claim this is all science. Yes it is indeed science, I will never contest that. And maybe it was just a coincidence that I got that call at that time. But the physical and emotional relief I felt at that one moment, and the outpouring of the human spirit and love (and faith) I have received over these last few weeks, have been nothing short of miraculous. Thank you, everyone – to humans, to gods, to Jesus and spirits everywhere. Thank you. Merry Christmas from me, my family, and Little Joe. P.S. : While looking at my bone scan during my follow-up appointment the surgeon asked if I ever broke my ribs. I have no recollection of ever breaking my ribs, I’ve been injured a few times, but nothing broken, from what I can recall. She said, “Mmm, yeah, you’ve broken your ribs.” Now I don’t know which sparring partner over the past nine years I need to thank for that, but if anything it made me feel a lot stronger about the year to come. I told my friend Amy that the book remind me of the workbooks we used to get in CCD class with worksheets asking those thought-provoking questions at the end of each chapter to see if we understood the material, if we were indeed ready and worthy to receive the Holy Spirit. I’m not ready. 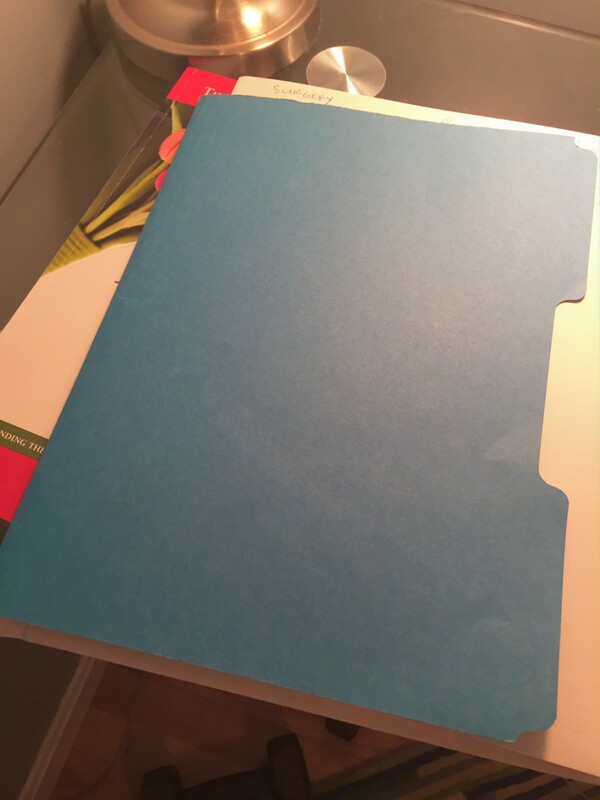 So it sits on my desk, with a blue folder on stacked on top of it. The doctor called with biopsy results late on a Monday night. Our beagle Little Joe was bitten by another dog earlier that day, we had spent the evening at the emergency vet clinic to get his ear stitched up. There were dishes in the sink, homework papers everywhere, dog blood still spattered on the wall between the kitchen and the front door from when Joe shook his head. It was about 9:30 pm and I just came in from attempting to walk Joe with the Cone of Shame, which many dog owners can relate that it’s nearly impossible. I came in to kids arguing, I yelled again about brushing teeth as I cleaned the wall. My oldest son said the doctor called, but he didn’t take a message because he’s calling back. I started to fume about not taking messages. Up until I spoke to the doctor that night I really wasn’t that concerned. I have regular mammograms, this year it was the same routine. I was just called back. And then called back again. And called again for an ultrasound. And called again for a biopsy. But the internet (I have more to say about the internet in a moment) states about 4 out of 5 biopsies are negative. I have no family history. Odds were in my favor. And plus, if it is positive, I know enough people that had a lumpectomy, maybe some radiation, and then they were good as new. Nothing I can’t handle. I managed to write four words during that 20-minute call, of which I can’t remember a thing. Two of the words are obvious, as if my hand was just writing what he was saying without any understanding. 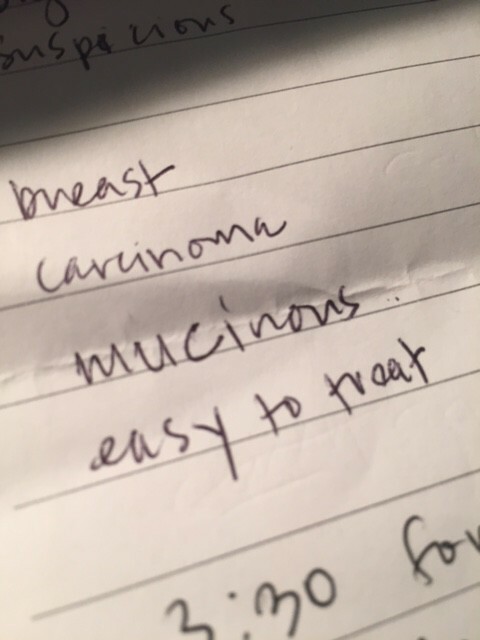 I did manage to write “mucinous” and “easy-to-treat.” But this isn’t entirely true – “easy-to-treat” and “treatable” are two different things. What I was told wasn’t the full diagnosis, I didn’t get the complete pathology report until the next day. I needed to sleep, I was supposed to be on a flight that next day to Las Vegas. I was supposed to speak on a panel that Thursday, and I still needed to pack. I decided to go to bed, and shockingly fell asleep for about two hours. At 1:00 am I sat at my desk and started searching. At 5:00 am I called my mother. She began to wail. The statistics show that only 1-5% of breast cancers are mucinous in nature, more prevalent in older women who are post menopausal. I’m still young, no signs of menopause. This type also generally doesn’t spread to lymph nodes. Next Friday I’ll have surgery to learn how invasive it has been to my body. Fingers crossed that in this last case, the odds will finally be in my favor. I didn’t go to Vegas. But over the course of that week I spent sleepless nights going down rabbit holes of treatment options, alternative medicines, recurrence rates and mortality rates. Luckily, the people I have told kept me in check. It was recommended that I don’t share this diagnosis socially right away; it’s too risky with all of the opinions, all of the stories of people who know people who went on strict diets or had special enemas or had their fillings removed and their cancer miraculously went away. I’m already on information overload. But I’m social in nature and a big part of my community is online, so eventually I was going to talk about it, the support is needed and welcome. But this is where I stand firm – I’m a fan of modern medicine and that’s not going to change. And I’m likely going to need a lot of it, including surgery, radiation, chemotherapy and hormone therapy. I’ve already gone through genetic counseling which will help inform the course of treatment over the next year. It’s going to be a long road. And my family needs support too, which is why I’m sharing the diagnosis here today. That’s where you’ll come in. But I have to accept that this journey will be part of me. I just can’t let it define me. As a veteran digital marketer, I serve as the VP of Growth and Engagement for Third Door Media, publishers of three of the industry’s leading websites – Search Engine Land, Marketing Land and MarTech Today – working with some the smartest and and most talented tech writers online today. @ruthburr @dr_pete Oh god now I'm wondering what You-tuber is going to test this. @ruthburr @dr_pete I earn my keep. And frankly, they should have made limited-edition Endgame-sponsored adult diapers. Copyright © 2015 Monica Wright. All rights reserved.